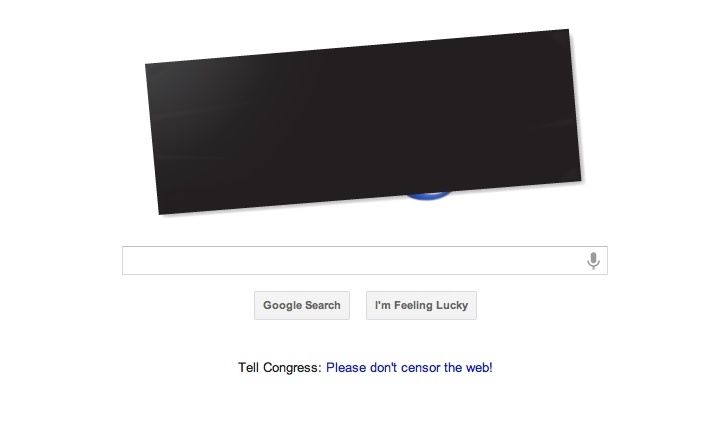 Google, Wikipedia, Tumblr, Wordpress, Reddit, Mozilla and innumerable other smaller websites are blacking out their service for 12 hours today in opposition of the Stop Online Piracy Act (SOPA) and the Protect IP Act (PIPA). PIPA would give the government and corporations the ability to shut down any site connected to an accused copyright infringer. Its companion legislation in the House, the Stop Online Piracy Act (SOPA), H.R. 3261, contains many similar problems, as well as threatening ordinary users with jail for streaming any copyrighted work - even just video of themselves singing a pop song. The Meetup Board organized a rally that met today at 12:30 outside of the New York Senators’ offices. The Senate introduced PIPA on May 12 of last year and the House introduced SOPA Oct. 26. PIPA drew 40 co-sponsors in the Senate and SOPA gained 35 in the House. Both bulls stirred up strong opposition from average Internet enthusiasts to The Colbert Report, Nancy Pelosi and the White House. Four days ago, the House shelved SOPA, leading many to believe that initial protesting had succeeded. Judiciary Committee Chairman Lamar Smith put this notion to rest, however. “Due to the Republican and Democratic retreats taking place over the next two weeks, markup of the Stop Online Piracy Act is expected to resume in February,” Smith said. On Jan. 24, the Senate is going to take another look at PIPA, a bill that still shares similarities to SOPA. In response, many major websites are advising users to contact their local congressman and demand that PIPA not be passed.